Acknowledging the distress of the poor and illiterate tribal people living there, Jeevanpran Shree Muktajeevan Swamibapa first visited the region of Panchmahal in 1952. Jeevanpran Swamibapa aimed to remove these deceptive beliefs from the communities and free them from the web of superstition. Jeevanpran Swamibapa travelled through the regions of Panchmahal on foot, giving these valuable life teachings to the poor tribal people of Panchmahal. His words of encouragement stirred their hearts and an enthusiasm of the kind they had never before experienced developed within them. Today, due to the divine blessings of Jeevanpran Shree Muktajeevan Swamibapa, and the continuous travels and teachings of Acharya Swamishree and the sants of Maninagar Shree Swaminarayan Gadi Sansthan, the people of Panchmahal have been transformed into moral, devout, God-fearing disciples. Lord Shree Swaminarayan transformed the lawless people of the Kathiawad region. This was acknowledged by the British Governors of the time. 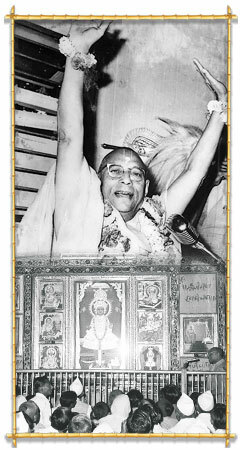 Similarly, Jeevanpran Shree Muktajeevan Swamibapa transformed the region of Panchmahal. And by Acharya Swamishree’s blessings, they continue to progress and flourish.